When NLM Director Patricia Flatley Brennan, PhD, called on NLM staff to unleash their creativity and provide art that captured the “Beauty of Science,” they answered with 23 submissions. Entries included 3D imaging of T-cells, a scarf woven with a double helix, scientific photographs, blown glass, a hand-carved wooden stamp of the Library’s front facade, and more. The artists included scientists, division chiefs, librarians, editors, web designers, and other staff. NLM winner’s “Dendritic Petals” is by Donald Bliss of the Lister Hill Center’s Audiovisual Program Development Branch. The “Beauty of Science” contest kicked off the 2016 Combined Federal Campaign (CFC), which raises funds from federal employees for charities. All NLM submissions for the contest were reviewed and voted on by Library employees, with the winner representing the Library at the NIH IC Directors Art Challenge this month. After several days of voting, NLM staff selected “Dendritic Petals” by Donald Bliss of the Lister Hill Center’s Audiovisual Program Development Branch. 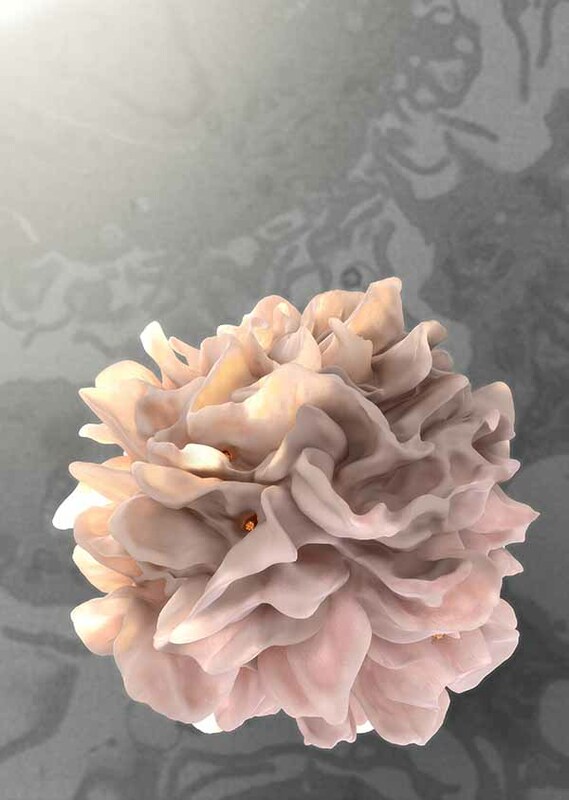 The stunning photograph of a 3D dendritic cell model suggested from HIV research resembles a pale pink flower. 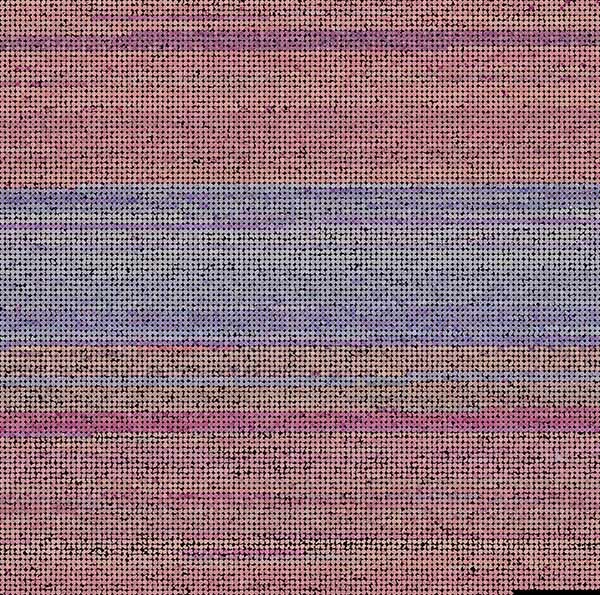 The image is “the result of a collaborative research project between the NLM and NCI [the National Cancer Institute]. The data show HIV-laden dendritic cells extending wide sheets of membrane to encase T-cells,” said Bliss. Other highly rated entries included “Self portrait” by Aynex Mercado and “Malaria Gobelin” by Stefan Jaeger. The contest offered an inside view of the diversity of talent at NLM and across NIH, with the ultimate winner coming from the National Institute of General Medical Sciences (NIGMS). 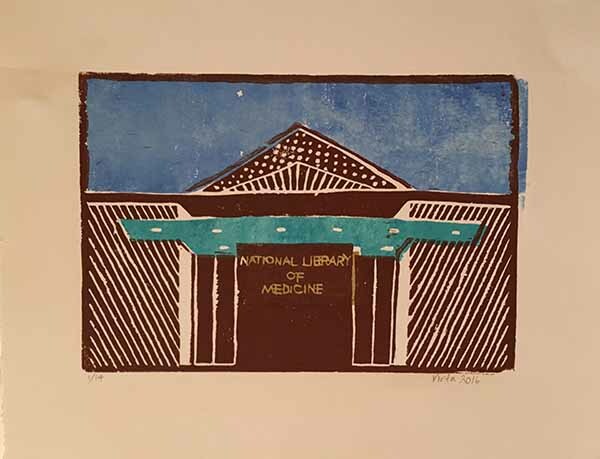 “Entry facade of the National Library of Medicine” is a woodcut printing from maple block, made using water- and oil-based ink. The print is by Valeria Virta, PhD, scientific editor with PubMed Health. 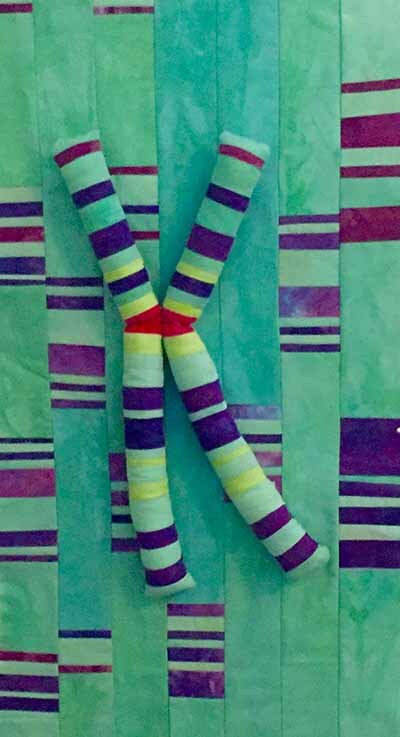 In “Selft Portrait,” Aynex Mercado, front-end developer at the National Center for Biotechnology Information, infuses her with work as a fiber artist with the DNA and chromosomes she spends so much time drawing. “Malaria Gobelin,” submitted by Stefan Jaegar, PhD, consists of a mosaic of about 14,000 malaria-infected red blood cells that have been inspected manually under the microscope to diagnose malaria in 200 patients at a hospital in Bangladesh. Dr. Jaegar is a scientist at the National Center for Biotechnology Information. October 21, 2016 in Events.